An assistant makes a smartphone smarter. Also, let’s assume that the millions of Galaxy S6, S8 and S9 owners have all downloaded Google Assistant – a very clever Voice First app that has a bigger search breadth than the Echo product line, or at the very least, is scoring well at answering somewhat geo-specific or fairly dopey questions. Should most of us care? Probably not, unless the device is a smartphone – there Google Assistant may be smartest. Alexa is missing a portable device, and Siri is apparently not worth listening to, but especially on the new HomePod. New products arrive in the market with a thud -- like Samsung's Bixby (getting smarter soon) and Cortana -- perhaps Microsoft left it for dead. Terminology is confusing and obscures what is happening. 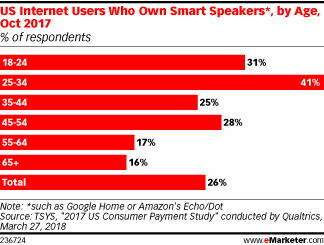 Smart speakers are hardware devices (like the Echo or Google Home) that run software (like Alexa or Google). Whoever made up the term was splitting out the hardware from the software – like Alexa or Google Assistant. Both are also software that can be downloaded onto smartphones from the Play Store. Even Apple fan boys (and girls) can run (and may prefer) Google Assistant on their iPhones as compared with Siri. If we could really see the sum of all usage of voice-enabled technology, what would the grand total be? And if someone knows that total, can they say? Consider older adults and the benefit of speaking up -- so to speak. Note the option of speaking to a device instead of tapping/pinching/zooming or typing on an auto-correcting and blooper-prone small keyboard. Hmmm. So what can we conclude when it comes to the predicted adoption of voice tech by older adults? The eMarketer report has ever-so-rare survey (below) with an age breakdown that offers a clue, but what is the real number? And see the ComScore chart about top use cases -- confirmation that this market has yet to mature. So think about it. What products or services today do NOT have an option for you to speak a request? Cars are full-voice ahead. Appliances – working hard on it. Home automation, aka Smart Homes, same. Fifty percent of the 65+ population now has WiFi – and can acquire a ‘smart’ speaker or just speak a command or question to a smartphone. Some worry about the loss of privacy from always-listening devices in the home. Consider that every single other device and software you ‘trust’ today has already been hacked (and that’s just in 2018), not to mention the rampant theft of health-related data.